There was a wind advisory in effect today. From around 10:00 in the morning to midnight. And yes, I felt it. Strong winds blowing, making my coat fly in weird directions, my laptop bag swing back and forth as it is hanging on my shoulder. Aside from the wind, my academic activities are also in full swing. I finally met the TA class I am in. Unlike the previous one, this has double the number of students, so it is 200. And because of that, it is less intimate, and the students are more of a part of a populace, and class discussions are not very likely. Last semester, it was a 100-student class, and so discussions were present, with students freely asking questions and the professor answering them. This time, it looks like the professor will be doing all the talking. And of course, we are going to be doing all the grading. 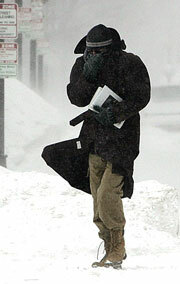 I saw the pictures from the wind out there... BE CAREFUL!!! Good luck with all the 100 extra students. I am rootin for ya! By the way thanks so much for your sweet sincere comment about my new hair cut. I love it too! :o) Brenton says hi too and said you are too sweet! Hope you are having a great warm night! Talk to you soon!!! off-topic: i know i haven't replied to your meme yet and here i am tagging you. since you're a linguist, i thought you'd be interested in a word-based meme. check it out on my blog.